Try these simple adjustments to make hill running less of a chore. Nothing builds running strength better than hills. Running inclines forces your muscles to work harder; as you grow stronger, your stride becomes more efficient and your speed improves. Despite the benefits, many newcomers (and old-timers, too) avoid hills – after all, defying gravity can be tough, both physically and mentally. But simple form adjustments and a gradual approach can reduce the challenges and boost your fitness. 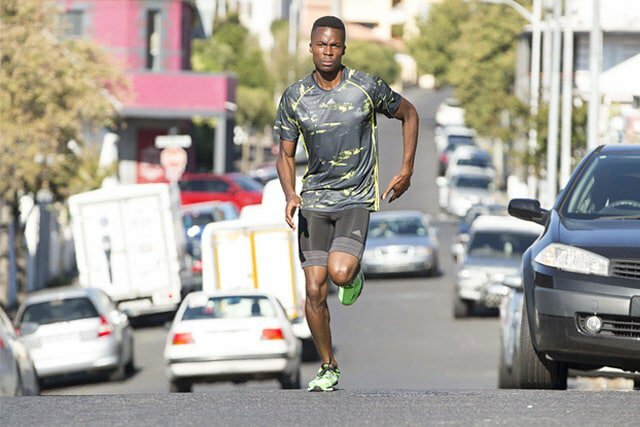 Add hill work to your training by following these four steps. For your first hill workout, jog for 10 minutes to warm up, then walk for two minutes. From the bottom of a gentle incline, run up at an easy pace for five seconds, then walk back to the starting point. Run up again for seven seconds. Walk down. Run for 10 seconds, then walk down. If you’re feeling strong, repeat. Cool down with a 15-minute jog. Do your initial workout several times, then ramp it up. Perform two lots of 10 seconds: run up the hill for 10 seconds, then walk down and repeat. Then do two lots of 15 seconds, followed by two lots of 20. On your next hill workout, repeat this sequence twice before rounding the session off with a 30-second run. Schedule a hill run every seven to 14 days. As you get stronger, add time to your segments and/or add an extra rep until you’re running a total of 10 inclines. If you’re training for a hilly race, try to mimic in your workouts the types of hills you’ll encounter in your race. If your motivation dries up, run hills with a friend and take turns leading the upward charge. As you ascend, shorten your stride and keep your feet low to the ground. Try to keep your head, chest and hips perpendicular to an imaginary horizontal line. On descents, take short, quick, light steps, and keep your centre of gravity over your legs.